Best. Hubby. Ever! I asked Greg a while ago to make some murrine of the image on the cover of my book. He did make it and it’s been sitting on the work bench waiting for me to get time to make something with it. I did of course ask him to make a marble,but he balked and sort of ignored my request. I love it! It is pretty much exactly what I was hoping for when I asked him to make me one a month ago. One side has the silhouette image and the other side has houses with silhouette ghost people. The bottom has skulls and flowers. And on the top: The word Bourbon. Again, I have to say, I love it! Thanks, Greg. I’ve put it on eBay with the other marbles and have included a signed copy of the book in the listing. You can check it out here. 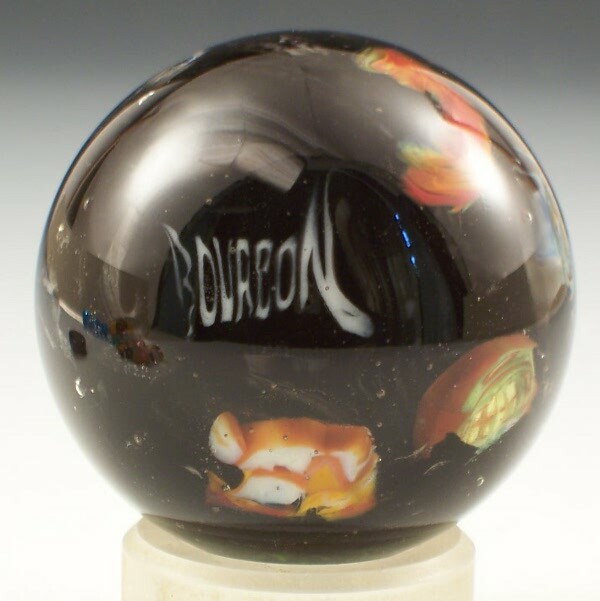 Ten years ago eBay was the big game in town for lampwork beads. It really seemed to be list it and they will come. These days, not so much. But if you’re willing to be patient, it can pay off. Why should you use eBay when you’ve been told (or experienced in the past) other sites like Etsy and Artifre are so much cheaper to use? I’ve got secret for you. The final listings fees vs sold items in my eBay store is often cheaper than my Etsy stores. Last time I looked, sales to fees ratio on eBay was 8.5% and Etsy across both stores was 9%. That is because eBay is now offering fifty free auction listings a month. You only pay final value fees when the item sells. This seems to be a permanent deal, but you never know when eBay is going to change things. Fifty free listings a month! That’s a huge bonus for someone trying to start a following there, because it takes a while to get noticed. Greg and I have five different internet stores and eBay continues to dominate our sales numbers. We have over the years tried many different sales strategies, but the one thing we have never changed is listing new stuff consistently. If you can listing something every day, that will mean you will always have an item listed under newest and one under ending soonest in the search categories. And customers will always be able to find you because your store never goes dark. The number one way to drive business on eBay is to list new stuff consistently. Now that we have that out of the way, here are some ways to be seen on eBay. Have a few items listed at over $50. 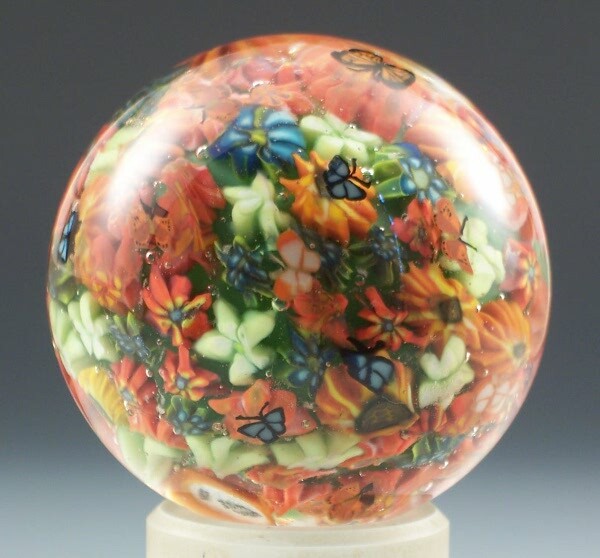 Many people start their search in lampwork beads by highest price in order to weed out the imported stuff. Go take a look using that search feature. At what page do you burn out and stop looking? Now look at what price those beads are going for. Strive to always have something listed above that price. Consider adding the Buy it Now feature. Some people really dislike the auction format. They see what they want and would rather just click through to buy it. On the other hand, some people get a high off of auctions. So have a mix of listings if you can. Here is how I handle it. All of my beads have a set retail price. For eBay I set my BINs at the retail price and the auctions start at my designer wholesale price. Around 25% off. Every once in a while if I have a new design I feel strongly about, I won’t set a BIN on the auction, just to see what the market thinks of them. If I get lots of bids, it helps me set the retail price. We also use the Buy it Now feature (no auction format) with the or Best Offer. I set these all at my retail price and entertain offers when they come . Some of them are ridiculously low. Like $22 for a marble listed at $100. At that point my options are to either accept the offer, counter offer, or decline. Usually when the offer isn’t even close I will just decline it. But most of the time I will counter and we play let’s make a deal. It’s kind of fun, but you have to be prepared that if you counter, the buyer may walk. And that is perfectly okay with us. We already know how much we will accept for something. If the offer is too low, it’s just too low. Try not be insulted by low ball offers. Everyone likes a great deal. 99 cent auctions. I confess, I’ve tried this and I hate it. If you’re going to run a 99 cent auction, be prepared you may very well end up selling your item for 99 cents. I always think of the 99 cent auction as an advertising expense. But I’m not sure it’s effective among the sea of hundreds of other 99 cent auctions. I’d try to use it in conjunction with some other kind of advertising. Something like a month-long ad on a jewelry makers forum, or a blog event like 99 cent Fridays where you run one every week. Something that can help you build a following around it. Now, if you are constantly making one of a kind items 99 cent auctions may work for you. Or if you have a huge following. Or if you are brand new and trying to build a following. I know many beadmakers who have used this strategy and have had it work for them. It doesn’t work for me. I do a lot of production work and in order to preserve my pricing the 99 cent auction just doesn’t work. Speaking of preserving pricing, if you sell wholesale to beads stores or galleries, they are not going to like it if you are undercutting their prices on eBay. This is why I go with my retail prices and a designer wholesale start price. If I listed everything at 99 cents, that would be a huge conflict. Sets or focals? Everyone wants to know what sells better. I can’t answer that for you. I sell both and marbles. So I think it all depends on the work you put out there. I can tell you, often what sells online does not sell as well in person and vice versa. So try different things until you find your niche. Pictures, pictures, pictures! eBay used to charge for added pictures. Now you can add a bunch for free. I’m not certain how many because I host my own on my website. I just like having sole control over my content in case an image is hot-linked somewhere. But that’s just a personal thing. Use up as many picture slots as possible. Most customers will not read your entire description, so try to get your pictures as clear and accurate as possible. And as always, link up your auctions on Facebook, Twitter, Lampworketc. Let people know your auctions exist. Put your link in your email signature. Send a newsletter letting your customer know you’ve started a new venue. Don’t have one yet? Time to start. Spread the word, but don’t be obnoxious about it. One post in each place is enough. Yep, we’re back at it. Greg will be demoing a marble tomorrow (Sunday) at 2pm CST, and I will be in chat to field any questions. The last two weeks were really fun, so stop by if you have a chance. That’s 12pm pacific, 1 pm mountain, and 3pm eastern. You fire up the computer, take a look at your email and there it is in the subject line: Custom order. When I say custom, I mean custom. Something totally new, that isn’t just a small variation on something you already know how to do. If someone asks me to make a peacock bead in pink instead of blue, that is not custom. That’s just a made to order item. Okay now that we have that straight on with the post. I’m going to be totally honest. Most lampworkers I know hate doing custom orders. Sure, there are a few out there that like it. I can only assume they enjoy the challenge or the opportunity to work on something they hadn’t thought of doing before. But from a purely profit standpoint, we almost always lose money on custom orders. At least on that particular order. If the item in question is something I think I can do and I want to do it, then I tell the customer to give me a few days (a week or whatever) to come up with something. Once I have something I like, I email a picture to the customer. At that time we talk pricing. If it isn’t something I think I can do, or if I just plain don’t want to then I politely decline. If I know of another artist who I think can do it or likes custom orders, I will point the client to them. Notice how I don’t ask for a deposit or even give a price until I complete the piece. This is because if it’s truly custom, I often don’t even know if I can make whatever it is the customer is asking for. I also will only consent to trying a custom order if I think it’s something I can sell if the original buyer backs out. Or if it’s a design I might want to add to my bead line. Look, custom orders usually take ten times the amount of time to complete than something I already know how to do. Usually it takes anywhere from five to ten beads to get the design right and that’s if I started out on the right track. So if someone wants me to make something for ten bucks that I have no idea how to do and it’s going to take me three torch sessions to figure out, it isn’t exactly the best short term business move as far as profit goes. Now, if I want to spend some time learning and it’s a design I’m excited about, then there are more benefits than that first initial custom order. You can’t put a price on development. A few of my beads came about because I explored ideas brought to me by customers. My peacock beads are one of them. 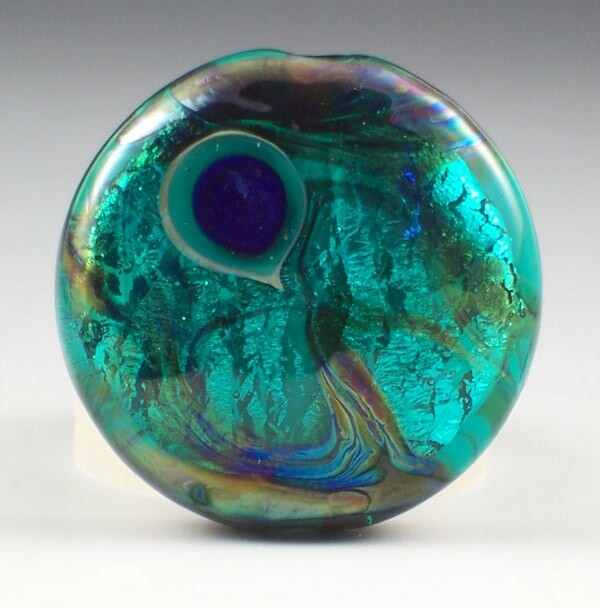 There are lampworkers out there that require a deposit to do custom orders. It’s a sound business move. But for me, if I don’t know if I can fill the order, I’m not comfortable taking any money in. For my made to order stuff, items I know I can make over and over again, if a customer places an order, I do require payment up front. In full.The customer pays. I make it, then I send it out. Usually within a few days. Custom work can be fun if it’s the right project. Greg once had a request from the adult children of one of our long time marble buyers. 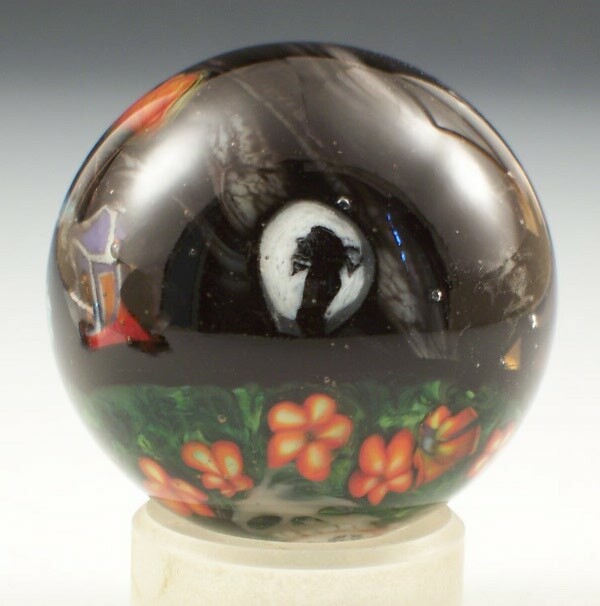 It was a custom marble for their parents fiftieth wedding anniversary. The style was one Greg felt comfortable with and he went ahead and took on the order. The marble came out beautiful and the family was very pleased. Greg got a lot of joy out of making that piece and I know he felt honored to have been asked to make it. I’ve heard many lampworkers groan over custom work. I’ve done it myself. But since I started picking and choosing what I want to do and politely declining those I don’t think I can successfully pull off, I no longer cringe at the ‘Do you do custom work?’ email.